A year after Frozen Crown's debut comes their followup, Crowned in Frost. Those who liked the first album will find this one virtually unchanged: the detailed neoclassical guitar; the gunshot drumming; Giada Etro's duets with Federico Mondelli. The sound captured here, with the symphonic parts slightly deemphasized, is a strong contender for Italian power metal's future sound. Guitar virtuosity and a fantastic clean female voice are the two most noticable ingredients in a winning combination. The symphonic keyboards are still dominated by the razor-sharp shredding of Mondelli and 18-year-old prodigy Talia Bellazecca, so they focusing instead on an AOR-style piano tinkling over the bass. The previous melodeath-inspired "harsh" vocals are still present, and as superfluous as ever. I still fail to understand why the band likes this feature of their sound, but it is kept safely out of the way most of the time. On occasion, other extreme-metal fixtures such as blastbeats and tremolo picking make their appearance. On Winterfall, everything stops in the middle for a keyboard solo, which is not only a surprise given the harsh musical treatment but adds contrast. There are a few power metal bands (Mastercastle, anyone?) whose leaders realize that their guitars are the loudest and most noticable item in their production, and come to the conclusion that instead of turning them down, they ought to get a lady who can sing even sharper and louder. Such a lady is Giada Etro. In the past, she's had some difficulties being as strong a vocalist on the band's softer or slower songs as when she merely needs to produce volume and high notes, at which she excels; but this time around she nails it on Lost in Time, which is far superior to any of the previous efforts by the band to tap the brakes a bit. She can't send a chill down the listener's spine like Ancient Bards' Sara Squadrani, but her power and range is nonetheless impressive. The arrangement of her vocals into duets with Mondelli gives the songs a dimension that they wouldn't have otherwise, such as In the Dark, which features one of the more impressive samples of these. 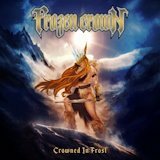 Crowned in Frost consists of small tweaks to what was already a great sound from the start. Fans of stripped-down, high-speed power metal are going to love this one.